After only reading one issue of the U.K.’s best DIY flavored extreme horror magazine, I’d call myself a fan. So when Jack Bantry sent me the next issue, I dove right in. I’ll begin by showing my ignorance as to who the cover art is trying to portray, but I’ll be damned if the M*A*S*H fan in me doesn’t want it to be a psychotic Alan Alda brandishing a butcher knife. And again, Wrath James White’s cover blurb—“It makes me nostalgic”—could not be more truthful. But let’s get to the meat of the sandwich, shall we? The fiction begins with “Balance,” a strange tale by J.F. Gonzalez, wherein a man wakes up to find everything in his life skewed, but not quite that skewed. The same people occupy this life but in differing roles. A heady but not all that extreme tale. 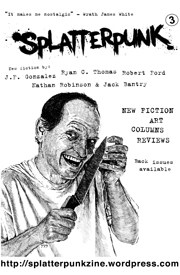 Ryan C. Thomas offers up “Ginsu Gary,” a darkly comedic take on an old urban legend. In this one we meet a flustered mafia henchman as he tries to get the “cleaner” to stop pitching products and get to work. Splatterpunk editor Jack Bantry teams up with Nathan Robinson to deliver a strange tale of odd justice in “Squash.” Never before have amphibians and revenge worked so well together. Robert Ford turns in a story entitled “Maggie Blue,” which, while being written well and cringe-worthy in its nastiness, seems a bit disjointed and wonky in its logic. As always, the stories are wonderfully illustrated, this time the guilty parties are Glenn Chadbourne, Dan Henk, and Daniele Serra. The featured interview this time around is with the always witty Jeff Strand, he of the twist ending and nasty premise, who is not afraid to show a lovable goofy sense of humor. Dig him. 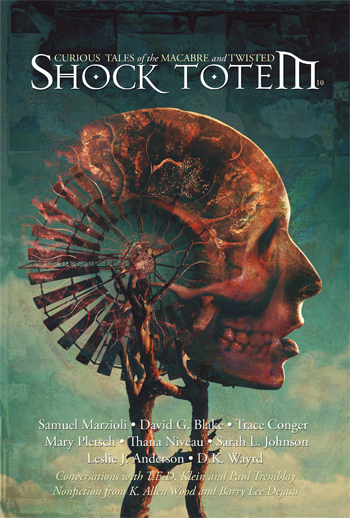 Rounding things out are another interview with editor Paul Fry and reviews (including a great one for Shock Totem’s reissue of James Newman’s The Wicked). While I didn’t enjoy this one quite as much as I did the last, it was still great fun. Please, do check Jack and Splatterpunk magazine out. They have their black hearts in the right place and aim to entertain. And that is the best target.